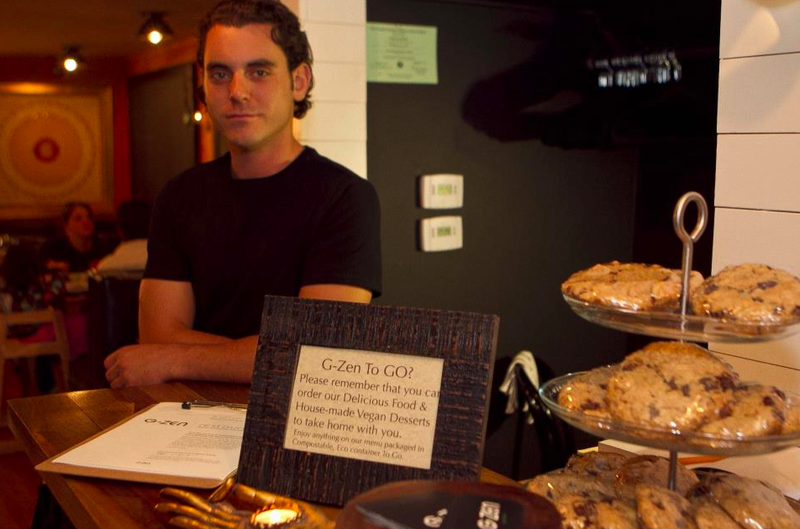 One of the first and few restaurant owners to reach out to me and say, ‘please make sure you stop by on your way through,’ was Ami and Mark of G-Zen. Ami is on top of her social media jazz (see here and here) so when she first heard about the trip she initially invited me to stop by their vegan food truck, GMonkey Mobile (more on this at the end of the post) as it was still open and in-season when the trip began. Unfortunately I didn’t make it to Connecticut until GMonkey’s off-season but lucky me, Ami and Mark opened a brick-n-mortar location this past fall. Hence, my arrival in Branford! 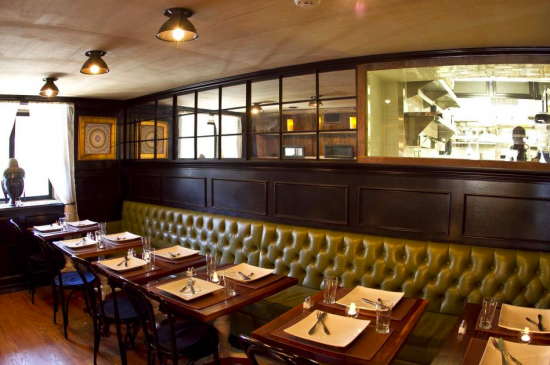 I had been staying in New Haven and planned a Saturday evening visit to this cozy little corner restaurant. It turns out that Branford is only about a twenty minute drive from New Haven. And since I was staying overnight in New Haven this worked out perfectly. I love when that happens! All but five of the following photos are courtesy of Ami, GMonkey Mobile and G-Zen Restaurant Co-Founder. I’ve just been using my iPhone to take pics and with certain mood lighting, flash or not, my pics come out horribly. It’s painfully obvious which photos below are mine. I’m okay with that. Ha! Thank goodness Ami had better ones! First, a note about the decor. This place is adorable! And versatile! I can totally see coming here for an über romantic date, or with a group of friends for some drinks, or with the fam for some great food, or just by my lonesome because hey, that’s how it goes sometimes. Although I didn’t get a great look around (it was packed when I was there!) I did get a few glances and really like the look and feel of this place. It feels warm and inviting with the wooden and white brick accents throughout, interesting artwork, and the variety of people that it seems to pull in. I was quite impressed with the scope of customers that were in and out while I sat in my little corner. There were some **clearly** seasoned veg folk (you know what I mean ;)), hippies, hipsters, and a biker dude here and there. As as well some traditional-looking families and nearly everything in between. You know there’s something good going on when a place can capture the likes of such a variety of patrons. 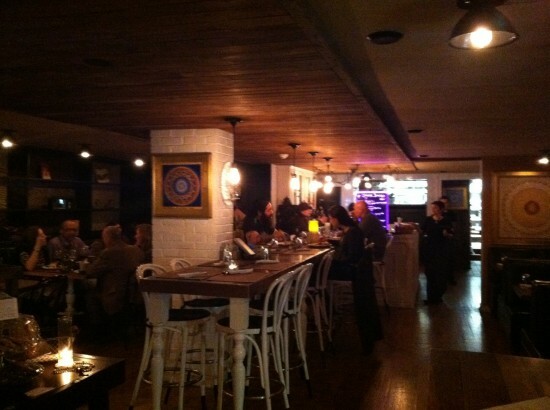 It also says a lot about the staff and their presentation of the restaurant and food. Well, done G-Zen! I started with a drink. I’m allowed! ;) This is the splendid ZenGria – G-Zen’s Sangria. Cute. 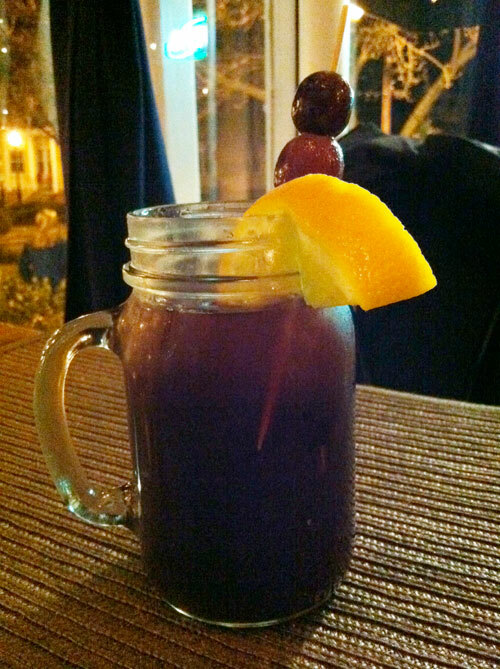 I didn’t write down the ingredients but according to my notes: “more fruity than liquory, yay!” That should do it. Haha!! These beauties are the Raw Tacos – full romaine leaves filled with chopped tomatoes, onions, and scallions. They were a tinge spicy (love! ), with a light ‘cheese’ undertone, a spicy faux meat sauce, and sprinkled with salty nuts. 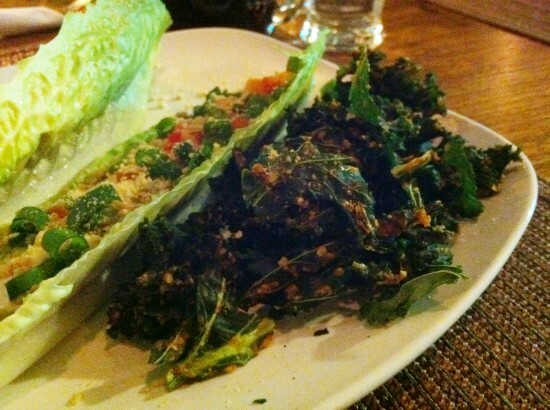 The Raw Tacos came with a side of yummy, yummy kale chips. 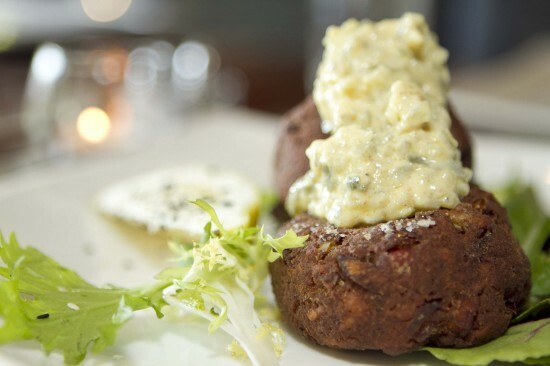 These are G-Zen’s Thimble Island “Crab” Cakes. These tasty little buggers come topped with a sweet, salty, pickley-ish, homemade tarter sauce. Very good! The crab cakes themselves were absolutely delightful. They are made up of seasoned tempeh over shredded greens and fresh lemon, bursting with rich flavor, yet tender. I recommend squeezing some lemon juice on these guys, per my notes, “it’s heaven!” According to G-Zen’s website, these are their version of the classic shoreline favorite. I never had ‘traditional’ crab cakes before so I’ll take their word for it. Ha! I love going over my notes about the food I’ve had. The first thing I wrote about this, the Portabella Napoleon Tofu dish, was “the gravy is **bleeping** awesome! !” Nice. 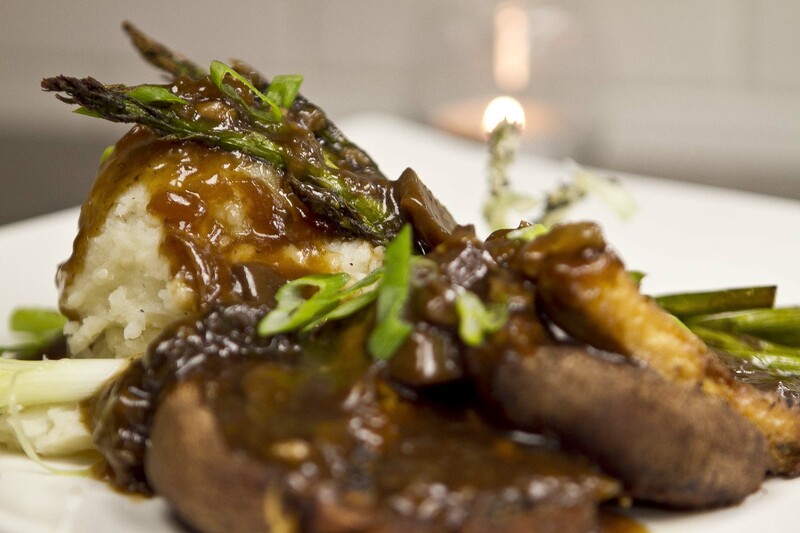 This dish is made up of a portabella mushroom and local organic Bridge tofu layered with caramelized onion, porcini mushroom merlot sauce with red mashed potato and roasted asparagus. They were actually out of asparagus when I was there so they prepared a side of garlic kale instead. I love garlic. I also love kale. So if anything, it added awesomeness to this dish. The ‘taters were perfectly smooth (well whipped!). The tofu was hearty, tender, and sweet and the mushrooms were just delightful. Are you ready for this? These my friends, these are THE best nachos I’ve ever, ever, ever had. 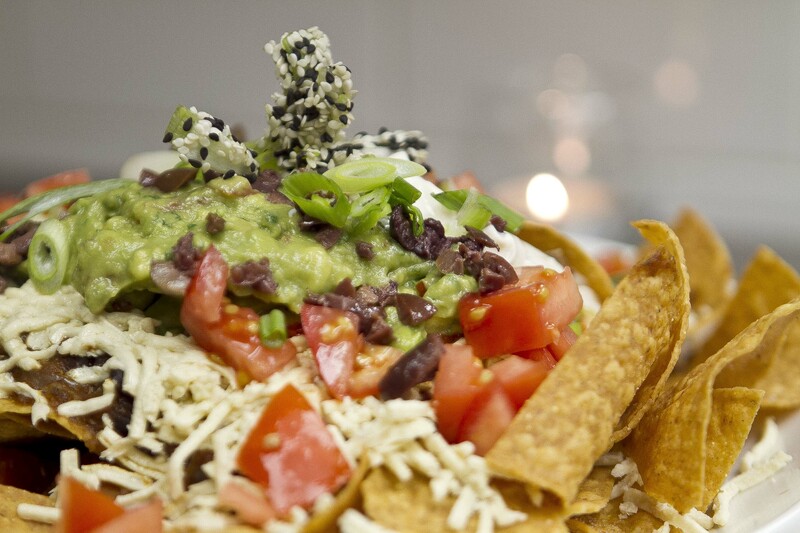 I give you G-Zen’s Sublime Vegan Nachos (also wheat-free) – house made corn tortillas with spicy black bean chili, fresh made salsa, guacamole, kalamata olives, scallions, tofu sour créme and an option to add melted Daiya cheese. You could absolutely get these as a meal on their own. The plate is huge and filling, and just so, so, so delicious. I ended up only having a few bites because clearly I went overboard on the number of items I ordered (heh!) and took the rest to go. I actually had the rest the next morning, for breakfast. Believe it or not they were still unbelievably good. The next day! That’s a hard test for a nacho plate. But G-Zen’s nachos passed with flying colors! So what made it so good or better than other nacho plates I’ve had? Well, there were a few superior elements at play: fresh ingredients (made in-house! ), including the nachos. This is a big one! 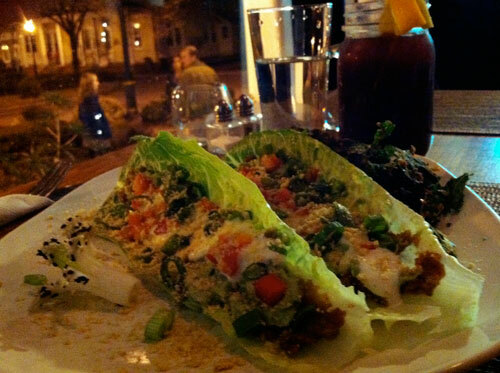 It was also made up of things that I adore on their own, like guac, olives, and sour cream. Yup! And G-Zen also does a wonderful job of balancing the amount of each layer so that they compliment each other perfectly. You know how sometimes with nacho plates there’s too much bean, or not enough salsa, or something like that. Or maybe the tortilla chips get soggy super quickly. So many things could go wrong. G-Zen figured out the formula though. These nachos are TIP TOP! The G Fries seem to carry their own celebu-status as being what put G-Zen’s head Chef and Co-Founder, Mark Shadle on the map (more than twenty years ago). 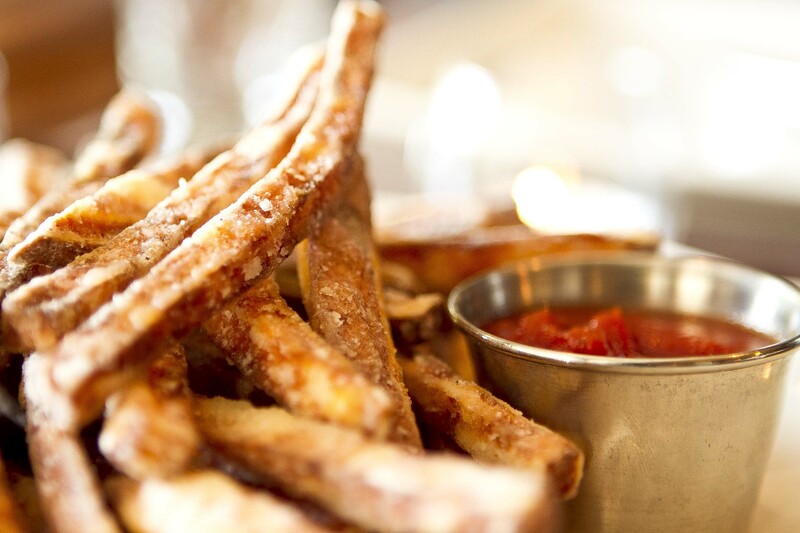 These are hand-cut sweet potato fries with house-made smoked hickory ketchup. The fries are great but I think it’s the unique ketchup flavor that gets me. Yum! 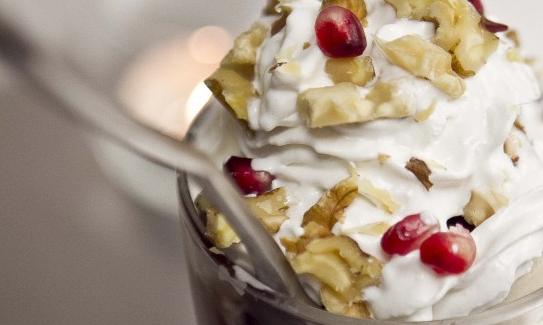 I have trouble when it comes to vegan ice cream. I can’t say no! Sometimes I’m feelin’ chocolate cake (okay most of the time I’m feelin’ chocolate cake … or chocolate anything) but tonight I was in the mood for something a little sweeter. 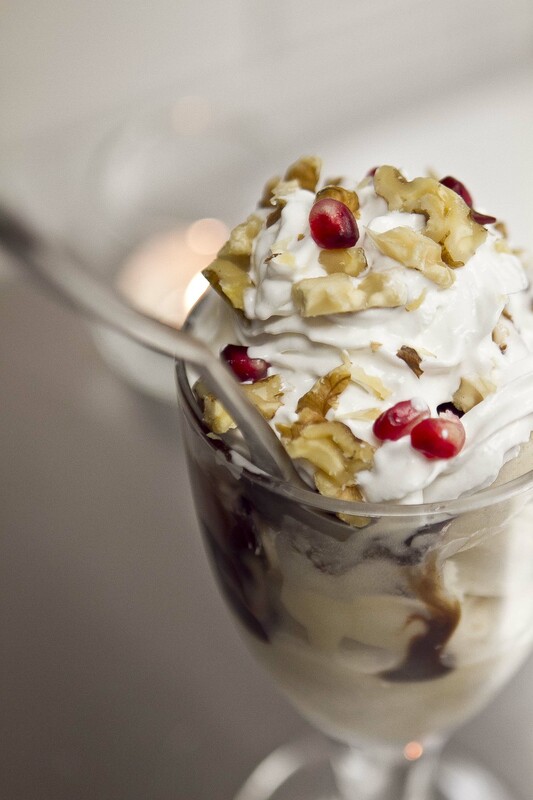 Enter, Ray of the Sun Dae – organic vanilla Nice cream, chocolate fudge, soy whip, and chopped walnuts. Do I really need to describe this? I mean, just look at it. ‘Nough said. Yes? Yes! If you’re like I was on this night you’re about on the floor…either from overeating or from overwhelm of G-Zen’s mind blowing yums. Okay, okay pick yourself up now. Really. It’ll be okay, I promise. Hey, look! It’s my server from that night, Nick! Funny, I was checking out G-Zen’s Facebook page (they’ve got a great/active page, btw) just before I was getting ready to post this and there he was. Handsome, no?! 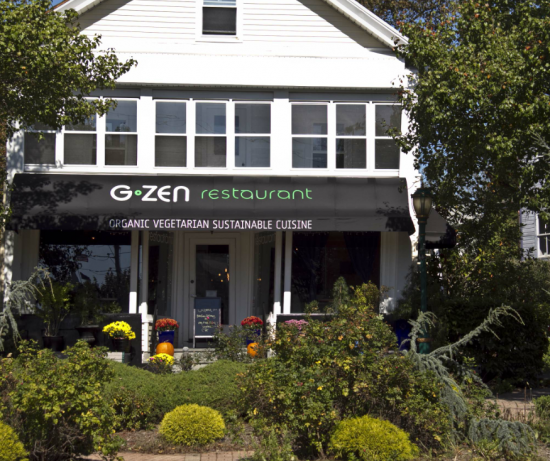 Given the huge success of G-Zen the restaurant you might not realize that Ami and Mark started their “G series” with GMonkey Mobile. The first in the Nation of its kind! 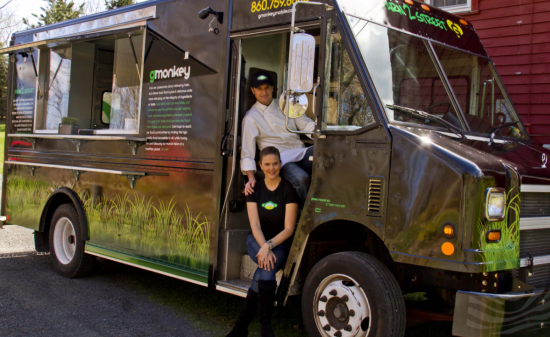 Launched in May of 2011, GMonkey Mobile was Ami and Mark’s first collaboration and love, second to the love they share for each other of course. 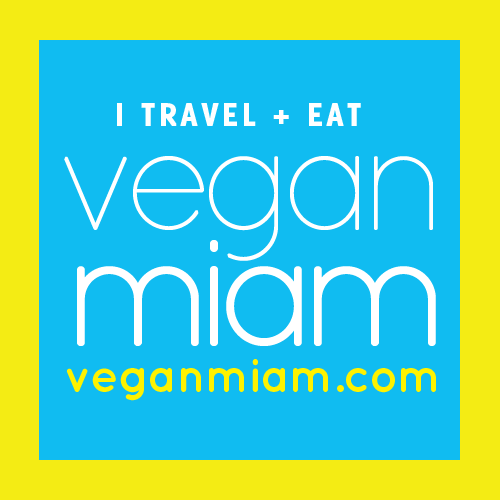 This sustainable, all-vegan mobile food truck runs on solar power and bio diesel veggie grease; making national televised news on NBC, FOX, and CBS in less than a year from opening, resulting in the Best New Mobile Truck Business award last year. I Love The G- Brand! Okay, for all of you who’ve been following along you know that occasionally I get really excited (and must share) about something marketing related. It’s my thing! What can I say!? I LOVE how Ami and Mark have branded their “G” Revolution. For starters, the website is so unique and fun! They’ve got their little monkey logo, which is carried over from their GMonkey Mobile website to their G-Zen Restaurant site. The respective websites are simple, clean, and easy to navigate. It’s very clear where to find the information you’re looking for. Plus they’ve got high quality, beautiful photographs, which we all know are key to drawing in people who know nothing about a business. The color scheme is used consistently across most of their media platforms, which again, is key so that we (as consumers) begin to relate certain shapes and colors with a specific brand. I also appreciate the time and energy that is clearly put into their online presence. Aside from well developed and maintained websites, GMonkey and G-Zen are all over social media. They’ve each got their own Facebook pages and Twitter pages. Not only do these pages exist but more importantly, they’re super active with relevant and enthusiastic daily updates, photos, suggestions, questions, and more. This. I. Love. Your server, uhm, I mean your food, looks super yummy. Ah and I love the title of the post haha. that ice cream looks soo good! SO excited I found this review! I live in CT and can’t wait to try G-Zen! 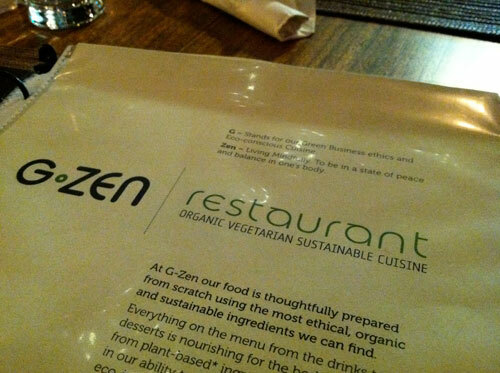 I plan on going for a belated Valentines dinner on Sunday hehe :) I had no idea we had such an amazing vegan restaurant close by! WOOHO! Lucky me! I live just down the road in South Norwalk so I’ll be coming up for dinner ASAP. Really thrilled to have a vegan restaurant of this caliber so close. Thought I’d have to go down to NYC to indulge.